There are always days in our lives that make you search for the obscure and the silly… those days when you need to have a place where you can escape the concerns and frustrations that are making you crazy and allow the comical to take over. Yesterday was one of those days. 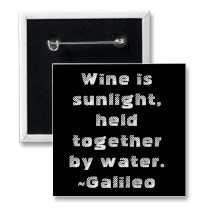 So to that end, I went looking for some fun (and funny) wine quotes to use at the winery where I work. I found a grouping, posted together originally (as far as I can tell) by a website called iloveindia (http://lifestyle.iloveindia.com/lounge/funny-wine-quotes-2953.html) that I thought fit the bill… I hope you enjoy them as much as I did. Remember… wine doesn’t have to be part of every day in your life, but it can certainly make every day of your life a little sweeter, a little brighter, and a little lighter. And with that, I’ll leave you with one of my favorite quotes, which I found on Pinterest. This entry was posted in Wine and tagged Funny wine quotes, wine.